Before the middle of 2007, Apple offered three distinct tiers of video-editing software. iMovie HD ( ) catered to beginners, but its evolved features and robust plug-in support held people’s loyalty long after they shed the “beginner” label. At the other end of the scale, Final Cut Pro ( ) gave professionals the advanced features needed to edit in the big leagues. Falling in between those two options, Final Cut Express, using the same code base as Final Cut Pro, offered pro-level editing for people who had hit iMovie HD’s ceiling and wanted more editing control and options. The release of Final Cut Express 4 redefines that tiered structure. The line between iMovie—in this case, the completely revamped iMovie ’08 ( )—and Final Cut Express is now a little blurry, making the latter not just a replacement step-up, but an accessory that can make up for iMovie ‘08’s shortcomings. This doesn’t mean that Apple has dumbed down Final Cut Express, although Apple’s decision to remove the Soundtrack application and limit the number of included styles for LiveType are unfortunate omissions. Rather, Final Cut Express 4 and iMovie ‘08 are tied together more closely than the two apps have been in the past. As a consequence, that tie could act as a slingshot to propel editors from iMovie ’08 to the Final Cut family. Final Cut Express HD 3.5 ( ) let you open iMovie HD projects directly. Things have gotten more restricted with the new version of Final Cut Express. You choose File -> Import -> FCP XML for iMovie and locate an XML file that you would have first exported from iMovie. Final Cut Express 4 can reference clips from your iMovie ’08 Event Library, but clips imported into iMovie at the Large (960-by-540) size display resolution artifacts (which you can see at the left side of the screen in this figure). Final Cut Express creates a new sequence that contains the source video files in the Browser and a movie in the Timeline that has the same edits as in iMovie. Any existing transitions are converted to Cross Dissolve transitions in Final Cut, and the volume levels of the video clips are retained. Everything else is ignored—sound effects, separate audio clips (such as background music), photos, Ken Burns Effects, video adjustments, cropping and resize settings all disappear. When you import an XML file generated from iMovie, Final Cut Express references the source footage. This isn’t new behavior, but combined with iMovie ’08 and its capability to store your entire library of video, you can use iMovie as a footage storehouse: cut together a quick assembly in iMovie, export it as FCP XML, and then bring it in to Final Cut Express to save some time. In another nod to the consumer market, the signature feature of Final Cut Express 4 is its ability to import footage from tapeless camcorders that store footage on memory cards, small DVD discs, or built-in hard disks in the AVCHD (Advanced Video Codec High Definition) format. This feature isn't available to owners of older Macs, however; you'll need an Intel-based Mac to import AVCHD and Mac OS X 10.5 Leopard for AVCHD footage captured to DVD. 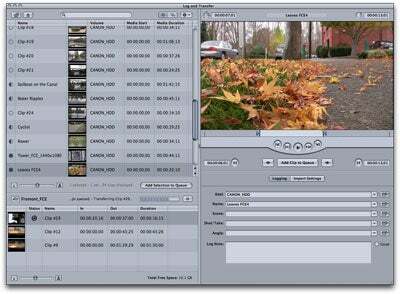 AVCHD uses MPEG-4 compression to store the video onto those media, which necessitates a new interface element for Final Cut Express: the Log and Transfer window. In the new Log and Transfer window, you can review clips while others in the queue are being ingested. Honestly, this is how importing video should work, and it approaches Final Cut Pro’s ability to log video from tape before importing it. When an AVCHD camera is connected, the clips in its memory appear in a list with thumbnails and durations. You can preview a clip, set in and out points to specify which section gets ingested, and enter logging information. Best of all, as you’re choosing the footage, it can be tossed into a queue for processing. Final Cut Express can ingest while you’re reviewing other clips, or you can pause the queue and save the ingest process for when it’s more convenient. Part of the reason for queuing material is that Final Cut Express does not import the AVCHD footage natively. As with HDV footage, AVCHD is transcoded to Apple Intermediate Codec (AIC) for editing within the program; this is the same behavior you’d see in Movie ’08 and Final Cut Pro 6. Why not work with AVCHD directly? 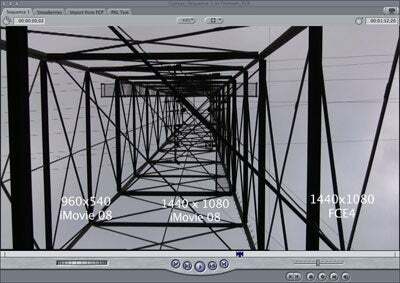 To achieve its level of compression, AVCHD stores a full frame of video only twice per second; intervening frames are made up only of the differences between keyframes. Final Cut Express builds those frames during the transition to AIC, so the program is expending processor power on editing and playback, not in generating frames on the fly. The transcoding step does add time to the ingest process. For a simple example, a one-minute clip took 1:34 to ingest on my 2.33GHz MacBook Pro; ingesting several clips totaling around six minutes in duration took 6:27. That’s not a serious speed hit, and no doubt performance will vary by machine, but it’s not as speedy as you might hope when moving digital data from a camcorder’s memory to your Mac’s hard disk. Unlike iMovie ’08, Final Cut Express ingests AVCHD footage at its full resolution, as you would expect. In fact, if you’re using iMovie as a video repository for eventual import into Final Cut Express, be sure to import the footage at full resolution; iMovie’s 960-by-540 Large size produces noticeable artifacts in Final Cut Express. Interestingly, Final Cut Express’s tapeless footage support extends only to AVCHD, not to video shot with camcorders that save to MPEG-2 format. In contrast, iMovie ’08 can import both. If the first clip you drag to the open format timeline is in a different format than the one you specified in Quick Setup, Final Cut Express offers to change the sequence’s format. Final Cut Express 4 inherits Final Cut Pro’s open format timeline, making it easier to collect clips of disparate formats in the same project with a minimum of fuss. I had no trouble mixing standard DV, AVCHD and HDV (all of them having been transcoded to AIC at import), QuickTime footage from a digital still camera, video recorded from my laptop’s built-in iSight camera, and PAL (25 frames per second) footage into a widescreen high-definition NTSC (30 frames per second) sequence. Final Cut Express assumes that you want it all to work seamlessly, so it automatically scales footage to fit the frame. 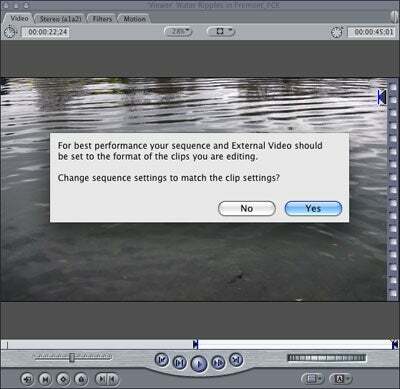 That can result in reduced image quality when bringing standard-definition footage into a high-definition sequence, but the result is better than viewing a postage-stamp sized DV clip in the center of the screen; plus, Final Cut Express offers plenty of control when it comes to resizing and repositioning clips within the visible area anyway. Also convenient is Final Cut Express’s ability to change the format of a sequence based on the first clip you add to the timeline; you don't have to remember to change the Easy Setup setting before you edit. Current Final Cut Express users, as well as iMovie ’08 users bemoaning the lack of third-party plug-in support, will appreciate support for FxPlug plug-ins, which open up the world of third-party plug-ins that currently run in Final Cut Pro. Version 4 includes more than 50 FxPlug plug-ins that augment the other effects included with Final Cut Express. But some users may not appreciate a pair of significant omissions in the new version. Final Cut Express HD 3.5 included the Soundtrack application for scoring movies, which you won't find in version 4. Apple claims that users were accomplishing the same tasks in GarageBand, but since Soundtrack 1.5 was built from the code base of Soundtrack Pro, it offered more options and better performance. As such, the Export for Soundtrack menu item is gone from Final Cut Express. However, if you have Soundtrack from the Final Cut Express HD package, you can still use the program with version 4. Final Cut Express still includes LiveType 2, but it ships with far fewer LiveFonts (prebuilt animated styles) and other effects than what was offered in the previous version. If you’ve upgraded from the older version, the library of LiveType effects works with the new version. The question with any upgrade is whether the new version is worth it, or if you can get along fine with what you currently own. With Final Cut Express 4, as always, the answer depends on your situation. Obviously, Version 4’s AVCHD support is a draw if you own a new camera that shoots in that format. As an upgrade from Final Cut Express HD 3.5, however, version 4 isn’t compelling unless you need AVCHD support or FxPlug plug-ins. If you’re an iMovie user feeling limited by its capabilities—or you’ve chosen to skip the revamped iMovie ’08 altogether—Final Cut Express 4 is a great way to jump into semi-professional video editing at a fraction of the cost of Final Cut Studio.